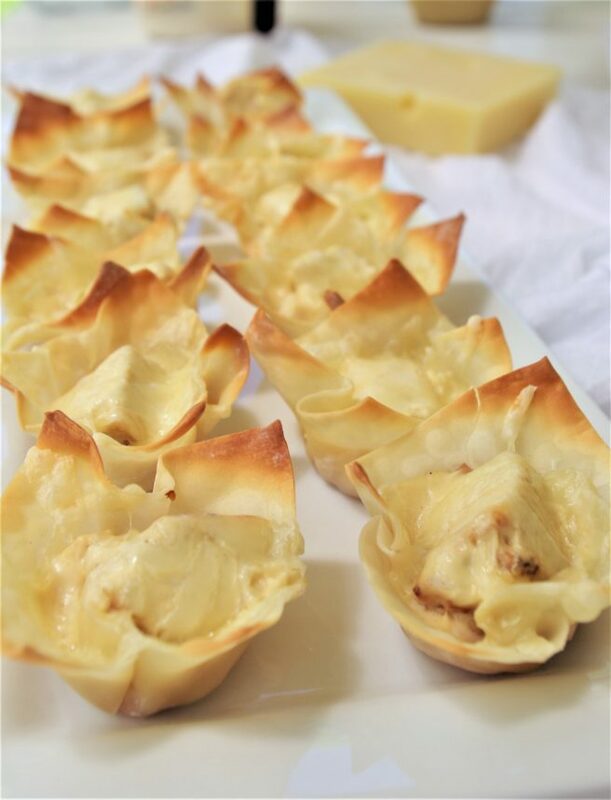 Layers of ham, chicken, dijon alfredo sauce and swiss cheese in delicious single serving cups! 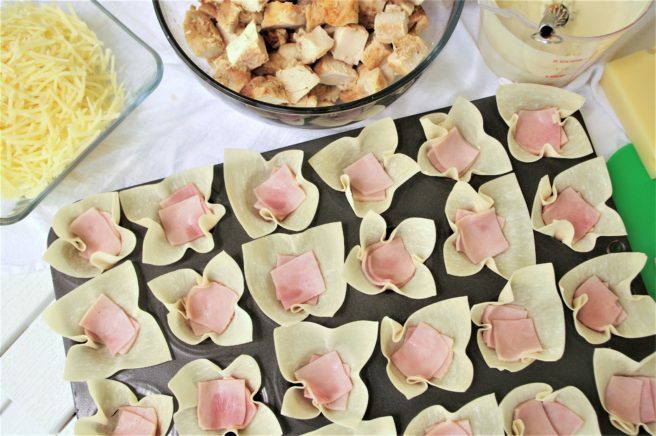 These bite-sized party favorites are SO easy to make! 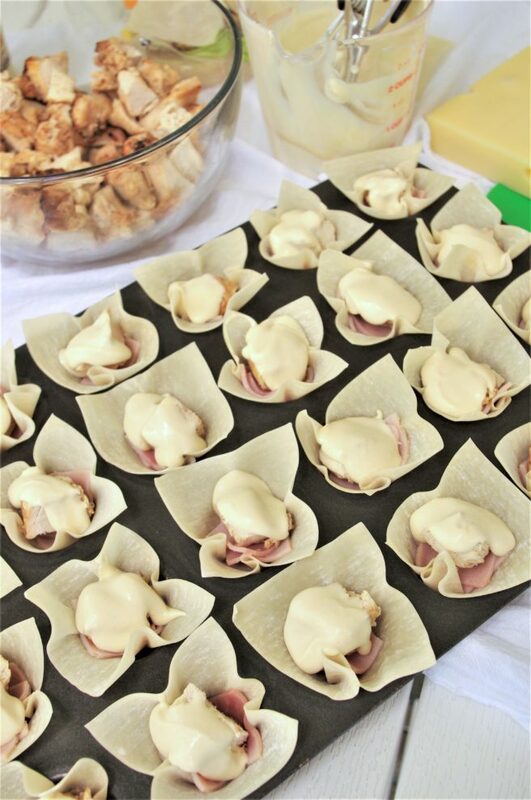 All the yummy flavor of chicken cordon bleu as a crowd pleasing finger food. It takes minutes to throw these together and only 10 minutes to bake. 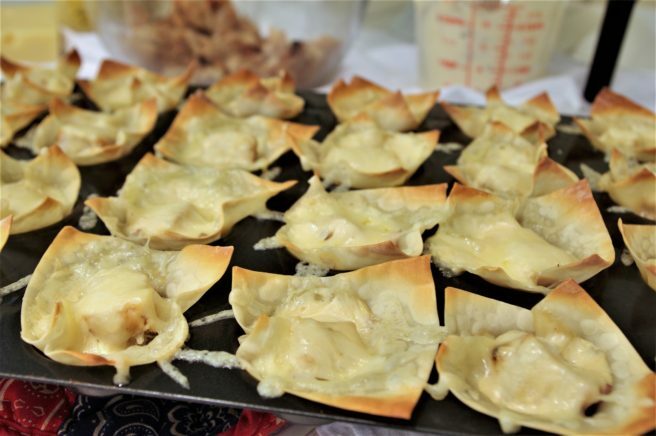 They look and taste so fancy, yet were simple and quick, so you can enjoy the party too! 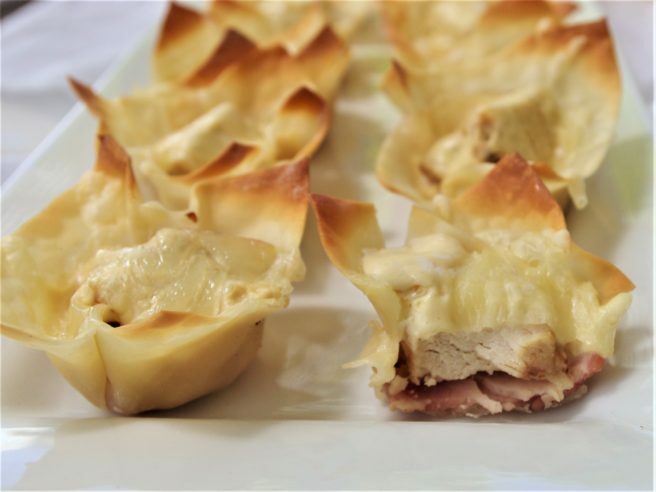 Who doesn’t love the combination of chicken, ham and swiss? They were meant to be combined. Add some dijon alfredo sauce and you’ve got a little bite of heaven. They look so fancy all set out together on your party table too! Perfect for tailgating, holidays or any day you want to feel like a party. Grab your simple ingredients, layer, bake and enjoy! 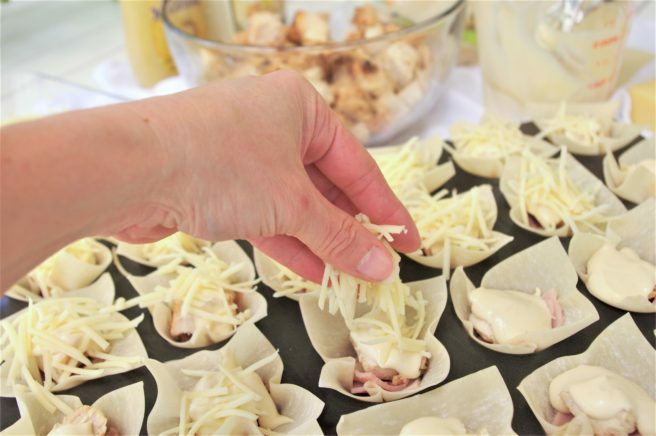 Press one won ton wrapper in the bottom of each of the cups on your mini muffin pan using your fingers or one of these SUPER handy and inexpensive tart shapers. 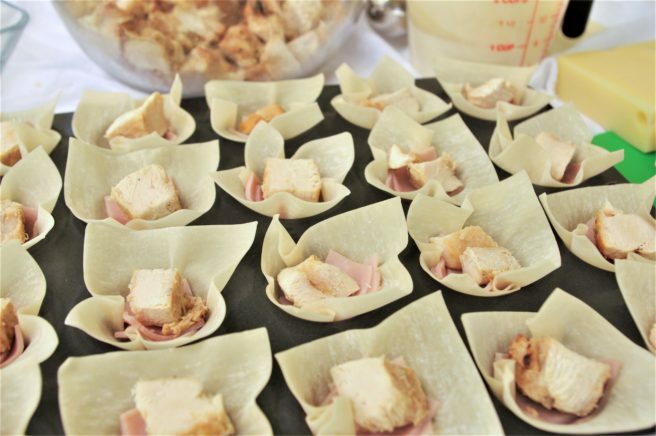 If you haven’t already, cut your ham into bite size squares that will fit nicely into the bottom of each cup. Add one, two (or three…) slices to the bottom of each cup. It’s super easy to control and doesn’t make as big of a mess if you use a cookie dough scoop for the sauce! Eyeball them and add more sauce to the ones that might have gotten skimped on. You want them to be nice and saucy but not smothered too much. Set your leftover sauce aside – you’re going to keep it and set it out in a pretty dish as dipping sauce! 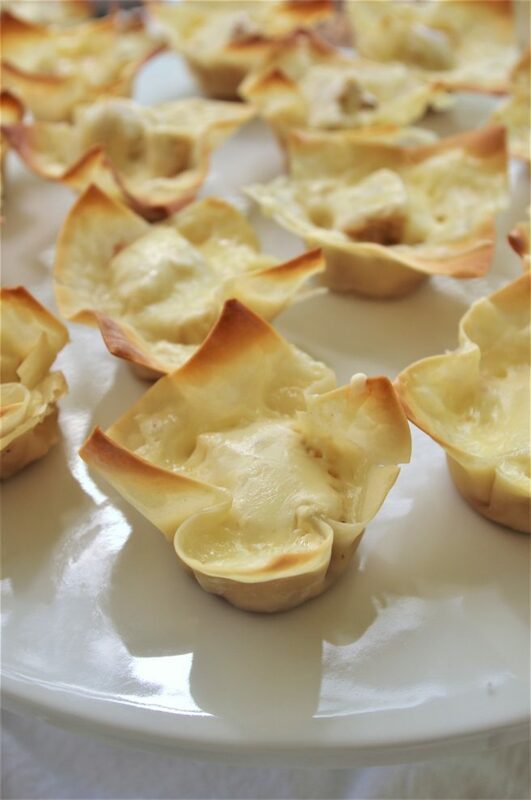 Sprinkle some swiss cheese on each cup in a nice even layer. If you are like us and LOVE cheese, try to resist the urge to overdo it on this layer. It will melt all over and make a ginormous mess in your oven if you go overboard. Use a butter knife to gently slip down the sides of each one to pry it out a little just in case some of the cheese got between and made it stick a little. Most of them will pop out easily, but this will ensure you don’t ruin any of them and they are all pretty for your party! WARNING: They go SUPER FAST so make sure you set some aside for yourself before you put them out! 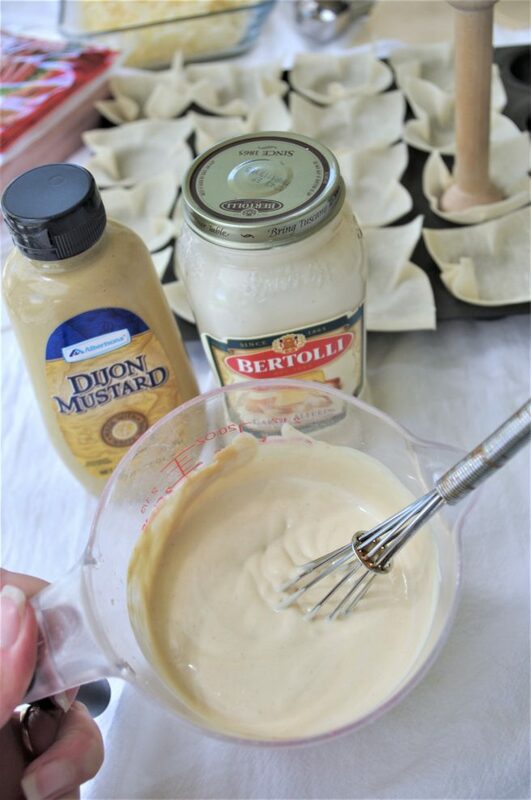 Make sure you set out the leftover dijon alfredo to use as a yummy dipping sauce! Finger foods were meant to be dunked. Fact. If you think they LOOK good – wait until you TASTE them! So rich and smooth and delicious. 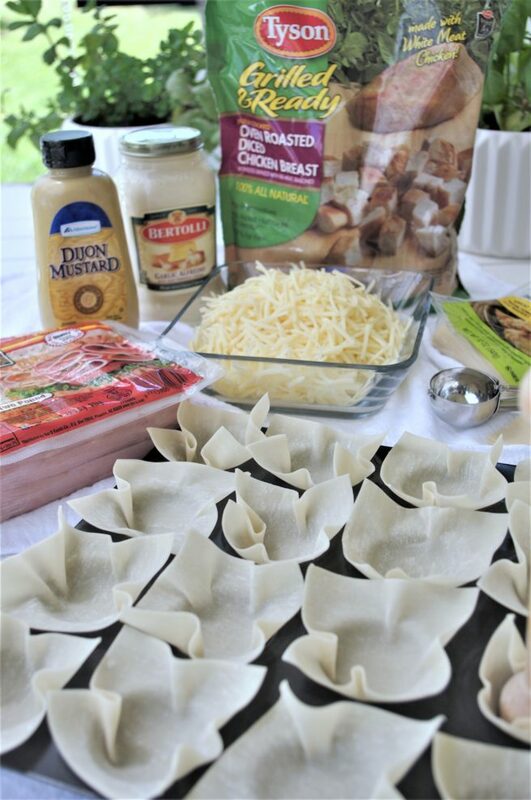 Make sure you PIN THE IMAGE BELOW before you scroll down for the printable recipe! 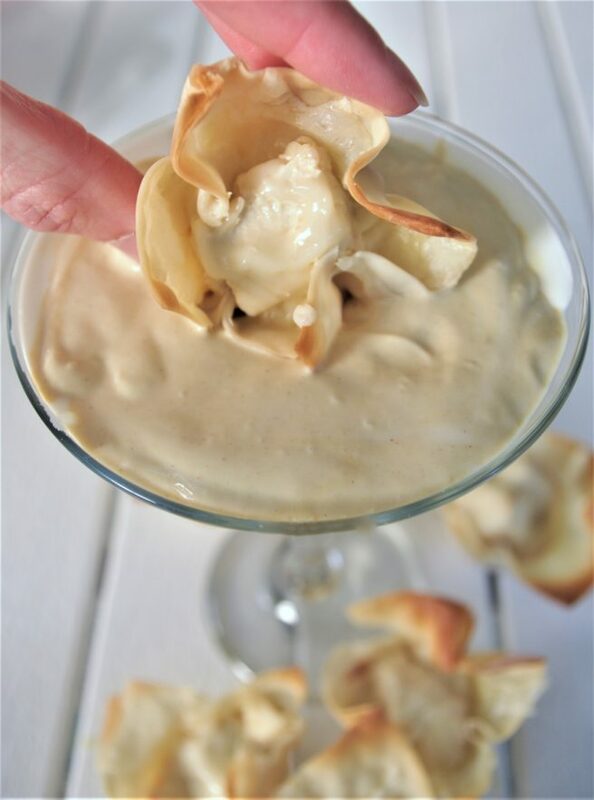 You’re going to want to make these for every tailgate party, New Years celebration, birthday or day ending in Y! 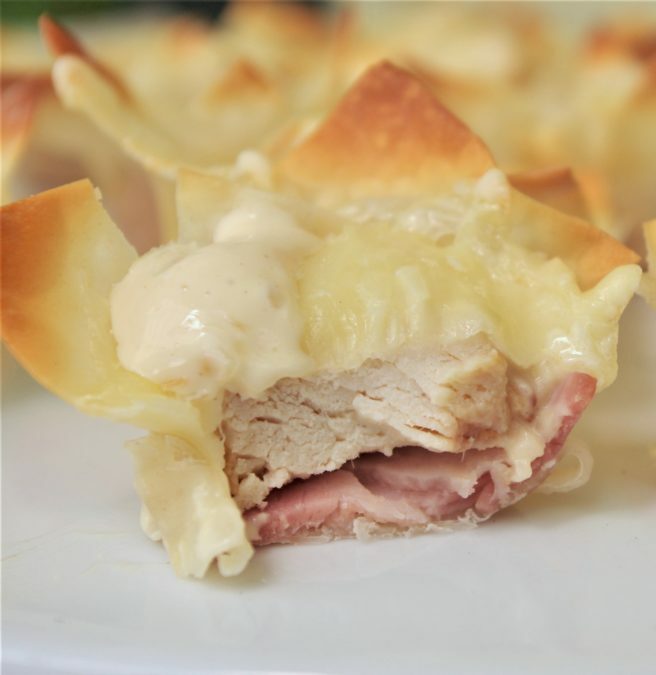 Layers of ham, chicken, dijon alfredo sauce and swiss cheese in delicious single serving cups! 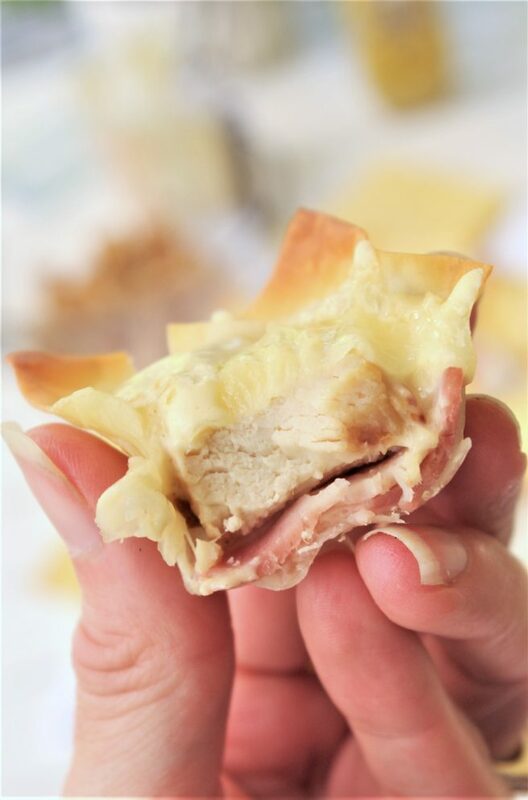 These bite-sized party favorites are SO easy to make! 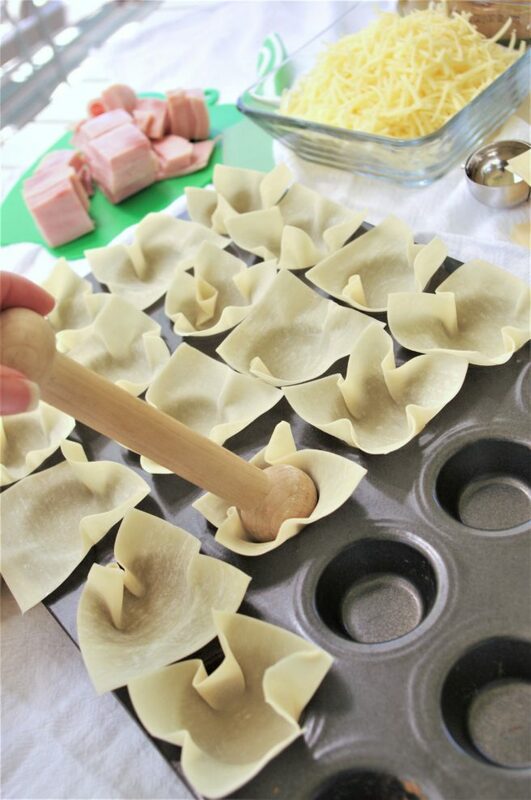 Press one won ton wrapper in the bottom of each of the cups on your ungreased mini muffin pan using your fingers or with your wooden tart shaper. 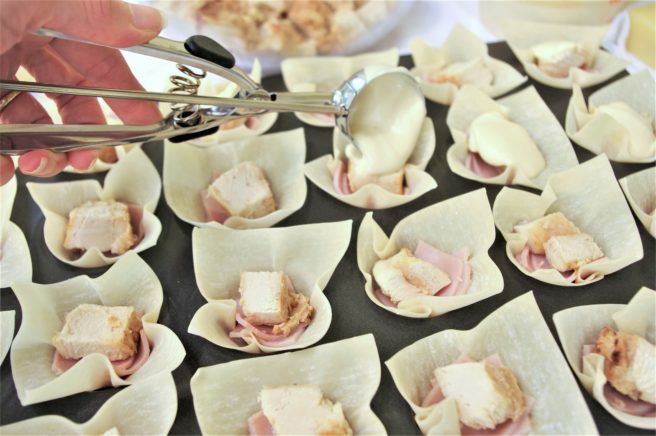 If you haven't already, cut your ham into bite size squares that will fit nicely into the bottom of each cup. Add one, two (or three...) slices to the bottom of each cup. 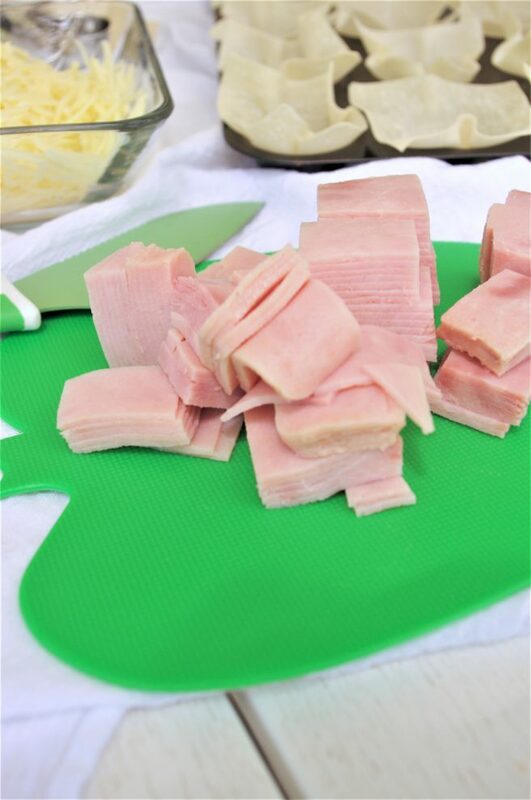 Chop your pre-cooked chicken into bite sized pieces and add one or two ( if they fit in a single layer) to the bottom of each cup on top of the ham slices. 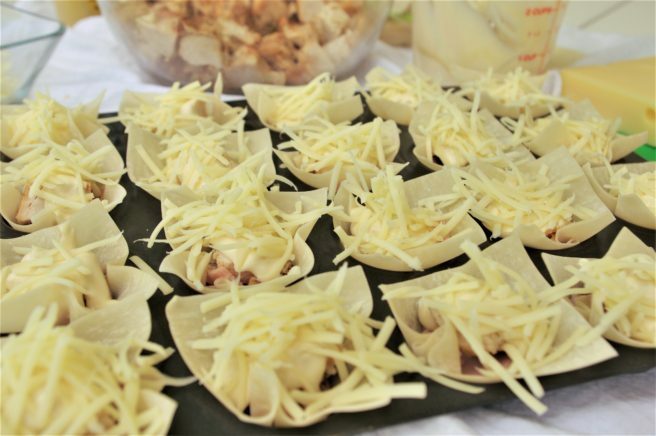 Sprinkle some swiss cheese on each cup in a nice even layer. If you are like us and LOVE cheese, try to resist the urge to overdo it on this layer. It will melt all over and make a ginormous mess in your oven if you go overboard. Bake at 375 degrees for 10-12 minutes (check at 10 to make SURE you don't burn the little corners! You want the tips to be a nice golden brown, not super dark). Use a butter knife to gently slip down the sides of each one to pry it out a little just in case some of the cheese got between and made it stick a little. Most of them will pop out easily, but this will ensure you don't ruin any of them and they are all pretty for your party! Set a few aside for yourself and set out the rest along with the remaining dipping sauce for everyone else to enjoy! 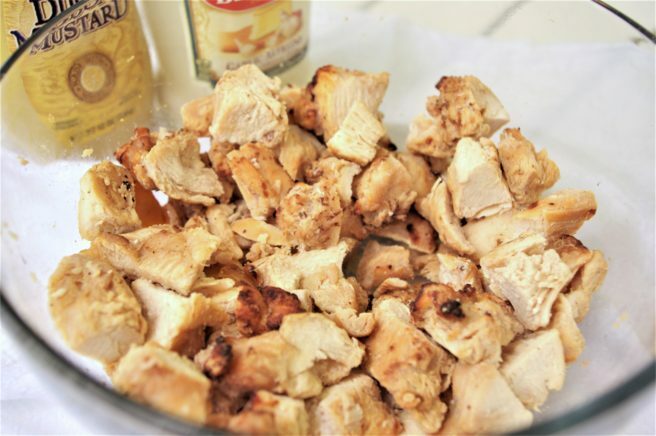 The BEST Chicken Recipes – Our Family Favorites of all time! For the Oven or the Grill – They are all sooo delicious. Don’t count on leftovers with any of them! Hello. I was wondering if you could freeze these? Hi Heather, I’m not sure, I’ve never tried. There’s nothing in them that isn’t freezable so it’s worth a shot! Just make sure you wrap them tightly if you don’t have a vacuum sealer. Let us know how they turn out if you try freezing them! Are these good at room temp Can you make them ahead? They are super good at room temperature! Just make sure you don’t leave them out TOO long, the chicken and ham in them makes me worry a little bit. You can absolutely make them ahead of time! Just put them on a cookie sheet and warm them back up at 350 degrees for about 6 minutes (watch them closely so the tips don’t burn) or pop a batch in the microwave and try 15 seconds at a time until they are as warm as you like. Enjoy!